As I’m sure you’ve already predicted, I’m writing this letter to expound on a new literary term I just invented. Here’s the name: THE PREDICTABILIY SPECTRUM. 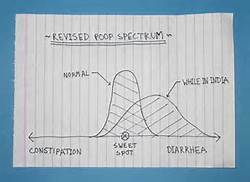 So I figured that if poop gets a spectrum, us literary folks should start thinking about getting some of our own spectrums too. Thus, I’ve created the very first literary spectrum (That I happen to know of). On the far left side of the spectrum, we have foreshadowing. Everyone knows foreshadowing. That’s when an author builds suspense by hinting at future events. It can be done with a recurring motif, a snippet of dialogue, a direct address to the reader, dramatic irony – you get the idea, the list goes on. On the far right side of the spectrum, we have Deus ex machina. That’s just an old Greek term for an unbelievable ending. In Greek drama, Deus ex machina was used when the plot was unsolvable. In those cases, the Gods would intervene, save the day, and everyone would go home happy. To be called Deus ex machina, the resolution of the conflict must seem random which means a total absence of foreshadowing. Similar to good pooping, good writing relies on balance. While a good dump finishes somewhere between constipation and diarrhea, a good ending to a novel can be found somewhere between completely predictable and totally random. It’s important to keep in mind that no two poops are alike and no two novels are alike either. For some genres and styles, a more predictable, softer ending is expected. Others require hard twists and turns in the plot before reaching an explosive conclusion. 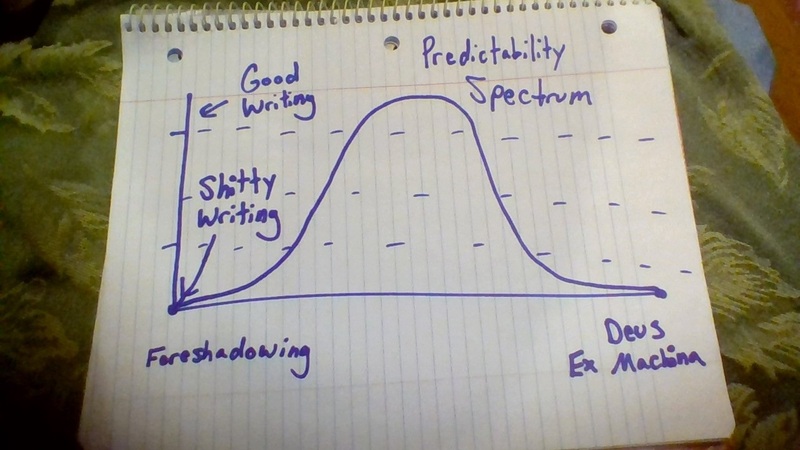 And that’s why I like the Predictability Spectrum. It allows for differences unique to the author and poop – I mean book. Well, that’s all I have to say. I doubt that you predicted any of that. Deuces. This entry was posted on Tuesday, November 11th, 2014 at 10:31 AM	and tagged with authors, blog, bloggers, criticism, humor, literature, satire, writers, writing and posted in Uncategorized. You can follow any responses to this entry through the RSS 2.0 feed.